Amy Juengling, born and raised in Buffalo, NY, was active in the National Woman’s Party and participated in the NWP’s picketing of the Woodrow Wilson White House. On November 10, 1917, Juengling set out with forty other NWP members to protest the imprisonment of Alice Paul at the D-C Jail. More specifically, they were protesting a denial of Paul’s status as a political prisoner (Cooney, 357). Juengling marched in the first group of picketers who descended on the White House. They carried banners of purple, gold, and white – the colors of the suffrage campaign. The protesters were arrested as soon as they took their positions at the east and west gates of the White House (Cooney, 358). They were not sentenced and were ordered released (Irwin, 258). Just four days later, on November 14th, Juengling and other picketers set out again to protest Paul’s treatment. Juengling was arrested as soon as she arrived at the White House, tried the same day, charged with unlawful assembly, and was sentenced to thirty days in prison or a fine of fifty dollars (Irwin, 260). Juengling and the other women refused to pay their fines and were taken to Occoquan Workhouse in Lorton, Virginia, to serve their sentences. Once there, the women fought to be recognized as political prisoners which guaranteed them certain rights, but the authorities refused. During what would later be called the Night of Terror, in the early hours of November 15th, the women, including Juengling, faced brutality at the hands of the Workhouse guards (Walton, 199). She and the other women were placed in small cells and were beaten. In protest of their treatment, the women began hunger strikes and were subjected to forced feedings by the guards (Irwin, 288). Kept from communicating with those outside the prison, the women wrote notes which were secretly smuggled out of the facility. Once word of their abuse was reported in the press, the public became outraged and called for the release of the suffragists. 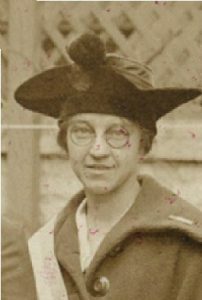 On November 27th, Juengling and the other suffragists were released from the Occoquan Workhouse. Juengling stayed involved with the National Woman’s Party after her arrest and imprisonment in Occoquan. On New Year’s Day in 1919, the National Woman’s Party began a new campaign called “watchfires of freedom.” She and other protesters burned the speeches of President Woodrow Wilson to call attention to his lack of involvement in the woman suffrage campaign (Cooney, 398). Wilson had verbally given his support to the passage of a woman’s suffrage amendment, but many members of the National Woman’s Party felt that Wilson should be more involved in the campaign (Cooney, 398). Mary Walton, A Woman’s Crusade: Alice Paul and the Battle for the Ballot (New York: Palgrave Macmillian, 2010).